A 9-page printable PDF version of this post can be downloaded here. Geoengineering is crazy. The sheer scale of the aspiration speaks of hubris. Terraforming the planet by pulling down billions of tonnes of carbon dioxide, or pushing millions of tonnes of plastic up into orbit is absurd. The material intensities and costs are ridiculous. And yet, with no deep cuts in emissions in evidence, with atmospheric CO2 at 390 parts per million and climbing at a rate of about 2 ppm a year, our “safe” working level of 350 ppm is rapidly disappearing in the rear view mirror even as we’re pushing the pedal harder to the floor. We do a lot of crazy things. But what if there was a geoengineering approach that used no materials, almost no energy, works at sea level, with cheap technology we could start deploying at scale today? That’s exactly what Russell Seitz at Harvard is proposing. In this post I want to look at his idea of increasing the reflectivity of the oceans with tiny microbubbles, It’s a fascinating, low impact concept, though not without some challenges. So I’ll also propose a different means to the same end that addresses these issues, and of course has some of its own. Then we can talk about how crazy it all is. In a remarkable paper published just over a year ago – which I highly recommend reading – Seitz proposed injecting microbubbles of air into seawater, effectively creating an “inverse cloud”. Sunlight is scattered back into space from these bubbles. This concept has no material inputs, bubble sparging equipment is cheap and low power, and could be installed on ships already travelling the worlds waterways. We don’t need to launch giant lenses into space or build giant balloon tethered pipelines to the stratosphere. We have a much more down to earth delivery system already in place, in the form of more than 10 000 ships at sea, 1300 working oil rigs and many thousands of retired platforms (3500 in the Gulf of Mexico alone) not to mention islands and suitable coastlines. The appeal of this technique comes from the fact that you only need very small bubbles to scatter light. Leveraging the cube law relationship for volume gives you a lot of scattering power if you can make really small bubbles. The air from a single 1 cm bubble, could fill a trillion 1 μm bubbles. Seawater naturally contains up to 1 ppm by volume of air as larger bubbles – in the 10-100 μm range. Their reflectance can be measured, but is so small as to be irrelevant to the Earth’s energy balance. But if this quantity of air were broken down to 1 μm bubbles, there would be a million more of them, and Seitz estimates the backscattered light would amount to several watts per square metre. That’s some serious power. Light scattering from small spherical particles is calculated using Mie theory, a fairly horrendous piece of mathematical machinery. 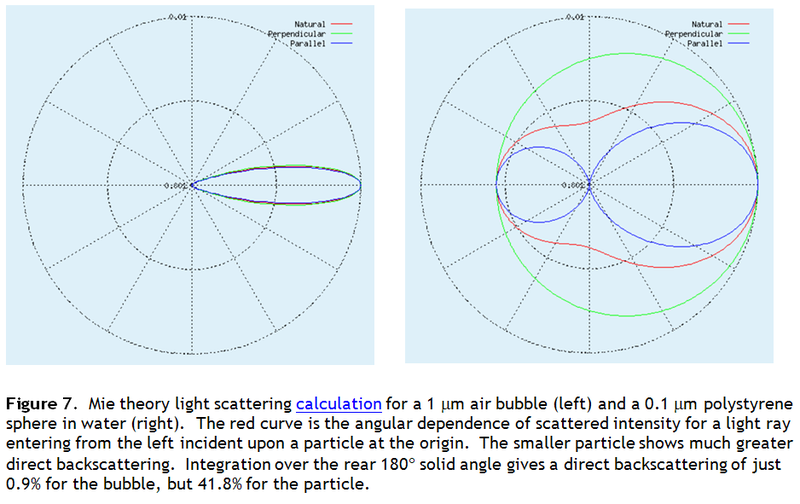 Seitz reports Mie theory scattering results 1 μm radius bubbles at various concentrations. At 0.2 ppm of air in water as 1 μm radius bubbles, the albedo (reflectivity) increase is 1%, equal to the current CO2 forcing (Figure 2). This is an astonishing result: global warming is fully offset by 0.2 parts per million of 1 μm bubbles! Using the IPCC mid-range climate sensitivity of 0.7 K per Wm-2 the global average temperature would decrease by about 1 degree, more than the 0.74 K warming seen in the 20th century. The NCAR CAM3.1 climate model was used to look at the effect of 1 ppm of 1 μm bubbles in a 780 ppm CO2 scenario – double our current CO2 level. Under this extravagant CO22 burden the model nevertheless indicated a cooling of 2.7 K [Seitz 2010; Figure 5]. So microbubbles really could be a powerful engineered response to climate change, if we can deploy them. But won’t these bubbles just bubble up to the surface and burst? Not the small ones, it turns out. The velocity of a rising bubble is readily calculated (from the Stokes equation), and a one micron radius bubble takes about 5 days to rise a metre. With near-surface mixing they’ll be there for a while. No, the real problem is that the bubbles want to dissolve. The air inside a bubble is at a higher pressure than the water it floats in, because surface tension is trying to pull the surface inwards, and the air is compressed. The pressure increase (given by the Young-LaPlace equation) is greater the smaller the bubble, and can be surprisingly large. For a 1 mm diameter bubble in seawater, the internal pressure is almost 3 atmospheres greater than the water outside. At these high pressures the air bubble will rapidly dissolve, even in water that is saturated with air at sea level. Unstabilized 10 μm bubbles in seawater are observed to dissolve in about 10 seconds. However, as Seitz describes, some seawater bubbles are much more durable, being stabilized by adsorption of natural surfactants and small particles on their surfaces. These materials form incompressible surface films that balance the pull of surface tension, and stabilized bubbles in the micron size range have been observed to last for 20-30 hours. So the key to the bright water concept is increasing the lifetime of these bubbles by ensuring that they are stabilized somehow. I’ll discuss some possible strategies for this below. Another problem is generation of microbubbles. Making large bubbles is easy. Making small bubbles is hard. To make 1 micron bubbles requires we pressurize air to three atmospheres. We could try to do this by pushing high pressure air through one micron holes. But in practice surface tension effects cause bubbles to stick to the hole and continue to inflate to much larger sizes. 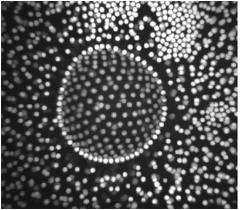 Seitz presents an image of a tank filled with micron scale bubbles generated by a commercial bubbler system (Figure 1). However, I harbour a degree of scepticism for manufacturer claims of bubble sizes especially below 10 μm, and from the images presented it appears the lower 10 cm has cleared in 120 s, suggesting (from the Stokes equation) that the bubbles are of the order 20 μm, consistent with my expectations for this kind of technology. We could instead inject air into a high shear mixer and break large bubbles down to smaller ones, like shaking up a bottle of soapy water. Here we are relying on turbulence to transiently generate 3 atmospheres of pressure throughout the mix. To do this by, say, shaking a drink bottle, you’d need to generate ~150 g acceleration as you shake. Vortex mixers can do this, but it is obviously an energy intensive process. Seitz calculates the energy cost of 1 micron bubble production to be ~1 kW hr m-3 of air, a theoretical limit which is unlikely to be obtained in practice. 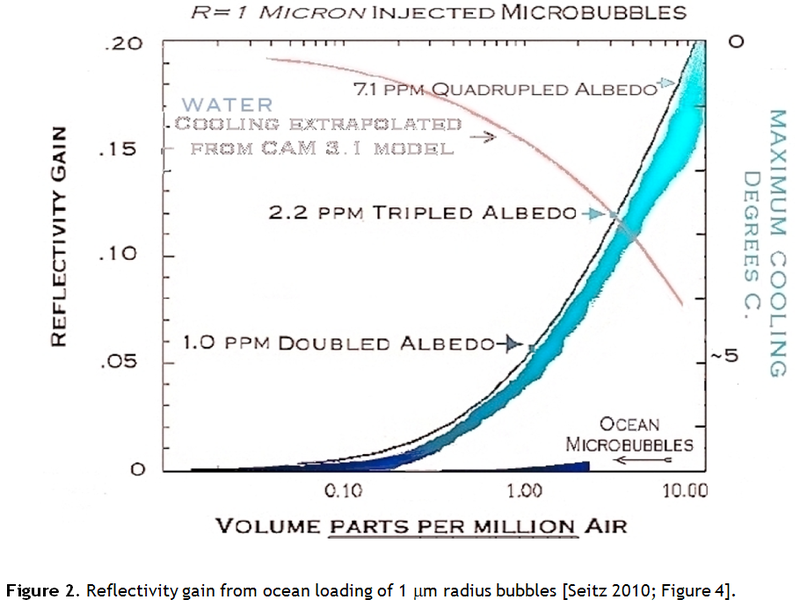 Seitz estimates that to sustain a bubble concentration of 0.5 ppm bubbles (1 mg m-3) in the top 10 m of the ocean would require the injection of 50 million tonne of air a year, if bubble stabilization for 20 hours could be achieved. Ignoring fixed structures and coastline, 10 000 ships would have to disperse about 11 000 m3 of air a day. Each ship would need to generate 11 MW hr a day for bubble generation, requiring 0.5 MW of dedicated generation. This is obviously a big ask. We can reduce the scale of the task by being more targeted about where and when we generate bubbles – by restricting deployment to the tropics where the sun is nearly overhead, rather than the high latitudes where the sun is low in the sky, and by timing bubble generation for daylight hours only. The biggest purely technical problem with the bright water idea is that bubbles are thermodynamically unstable due to their high internal pressure, with quite short lifetimes. An air bubble with 3 atmospheres internal pressure will dissolve in water saturated with air at only 1 atmosphere. And the smaller the bubble gets, the faster it dissolves. As observed above, a 10 μm bubble in seawater lasted 10 seconds. A 1 μm bubble would presumably last a fraction of a second. How can we fight this? Well, I can think of a few different ways. We could try to make the bubble surface impermeable to air. Surfactants can improve the barrier properties of surfaces to some kinds of molecular species. Phospholipid bilayers, for instance, are impermeable to water. Unfortunately, they do not present a significant barrier to nitrogen or oxygen molecules, which are soluble in these surfactant layers. I don’t believe targeting the barrier properties of bubbles will be successful. A second approach is to load the bubble surface with a raft of fine particles or proteins, which can support the two dimensional compressive load from surface tension, taking the pressure off the air, rather like a microscopic diving bell. This behaviour is observed in seawater bubbles. The long lived small bubbles reported by Johnson and Cooke were observed to be stabilized by a shell of adsorbed matter (Figure 3). Could this be a viable strategy for bubble stabilization? I don’t think so. 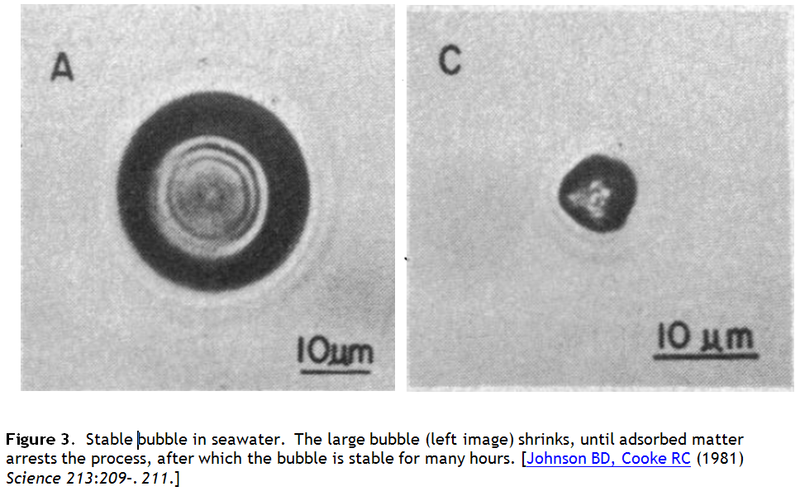 Johnson and Cooke report only “some” of the seawater bubbles they observed behaving this way, so we know the yield of stabilized bubbles in natural seawater is small. Stabilizing agents such as surfactants, and surface active proteins – could be added to the water, but the material input would be enormous and capture by low bubble concentrations hopelessly inefficient. And the observed lifetimes are still only about 20 hours. A third strategy is to apply a bit of thermodynamic jujitsu by adding a trace of an insoluble gas to the air, and use the bubble shrinkage against itself. As the bubble shrinks, the insoluble gas remains, and the partial pressure of the soluble gasses drops faster than the internal pressure rises. The bubble eventually stabilizes at a smaller size. Hydrogen is not very soluble in water. If 1% hydrogen were added to the air of a 5 μm bubble, air leakage would be nearly arrested before it got to 1 μm. This approach is actually used in medical ultrasound imaging, where stabilized microbubbles are employed as acoustic contrast agents. The insoluble gases favoured are perfluoroalkanes. These are more insoluble than hydrogen, and we have performance data for this system. 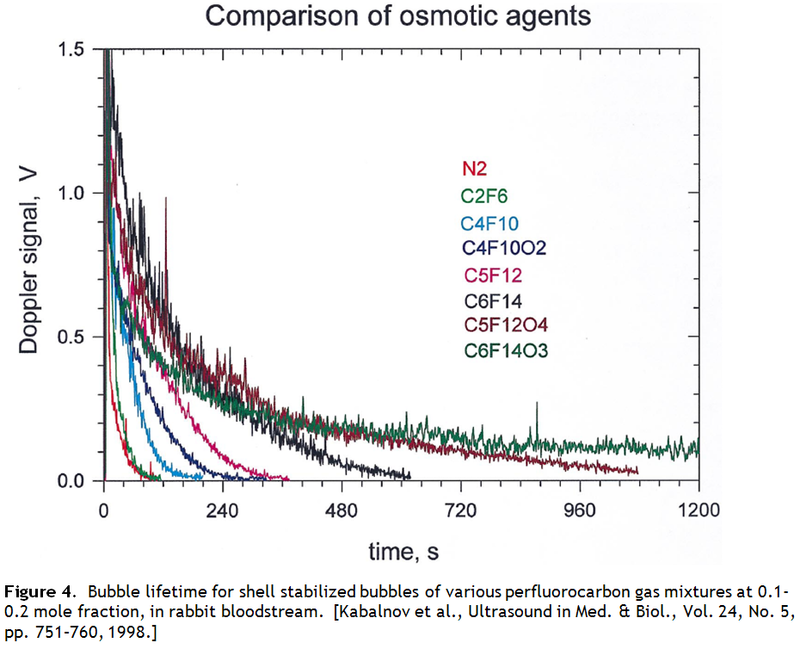 The lifetime of these bubbles in blood is short – a half life of 1.3 minutes for one lipid stabilized perfluoroctane bubble product. This does not bode well for bubble geoengineering. These ultrasound contrast agents represent the best that we can do now, under ideal conditions – a small volume, high value cost-no-object pharmaceutical product that can bear the expense of exotic very insoluble gasses and sophisticated lipid encapsulation stabilization strategies – and they still dissolve after a few minutes (Figure 4). In the end, thermodynamics always wins. Is there another way to look at this? The Achilles heel of the hydrosol approach is the short bubble lifetime. But are there other ways to brighten water? Are there any other micron sized light scattering particles cheaply available in prodigious quantities, which float in water and don’t dissolve? It turns out the answer is yes. Synthetic latex is produced on a huge scale – 1010 kg in 2005. A latex is a dispersion of polymer microspheres in water (Figure 5). The particle size is typically around 0.1 – 0.5 μm. The polymer content is high – about 50% by weight. And its cheap – a bit over a dollar per kilo wet. It looks like a bright white opaque liquid, like wood glue, which is a polyvinylacetate latex. Its a bulk commodity used in adhesives, paper coatings, paint and many other applications. The common polymers are acrylates, polystyrene and its copolymers, PVA, and others. These polymers themselves are inert and non toxic. Whether they present any physical risk to the biota needs to be determined but given the small particle size and low concentration in a milieu already loaded with natural micro- and nanoparticles it seems low risk. The main safety concern in my opinion would be any residual monomers, which are toxic. But these can be eliminated, certainly to the point where these materials can be safely unleashed on the public as paints and glues. The chief virtues of latex particles over bubbles is they don’t dissolve, they don’t coalesce, they are durable, and they can be made much smaller. They have a density of just over 1 g cm-3 so they sink, but at 0.2 micron the sedimentation velocity is too slow to matter. This presents a different problem – the chief loss mechanism now is not dissolution but loss by convection to deeper waters. Is there some way to keep these particles afloat? I think there is. Most of these latex polymers, polystyrene, for example, are hydrophobic – they’re water repellent. To keep the particles in suspension requires added surfactants, or putting electrically charged groups on the surface. But when diluted with salt water, both these stabilization mechanisms fail. Without stabilization a polystyrene sphere will attach to the water surface. Breaking waves will drive them under, but rising bubbles will scavenge them back to the surface again. This mechanism is well known and extensively studied in the mineral separation process of flotation, where particles of mineral ores are recovered from slurries by attachment to rising bubbles. The natural bubble population from breaking waves could keep even submicron particles concentrated at and near the ocean surface (Figure 6). The use of latex technology opens other doors for engineering particle properties. For instance, rather than producing a particle composed of a single polymer, its possible to construct a particle with two different polymers in a core-shell morphology, or even hollow particles. Such particles can have much higher scattering power than simple spheres, and are also made in bulk at commodity prices. Indeed, they are used as opacifiers in paint. We could paint the oceans white. Figure 6. Latex particles adsorbed on the surface of an oil droplet. Similar behaviour would be observed at the air-water interface. Lets run the numbers on this and ask, what would it take to reverse current warming? First we need to know how much light these particles scatter back to space. I used Mie theory to analyse scattering of 500 nm wavelength light (roughly the solar peak) from 0.1 μm diameter polystyrene spheres, as if the sun were overhead. The back scattering from these very small particles is intense – 42% of overhead light returns to space. And this is just direct scattering. Some of the light that scatters forward will scatter off a second particle, and a third. Multiple scattering will see more than 42% of light returned to space. Since these particles attach to the surface, lets consider, for the moment, a monolayer on the water surface. This requires 1014 particles per square metre, with a volume of 5.2×10-8 m3 per m2 (or 5 parts per billion of the top 10 m, for comparison with Seitz’ figures). Polystyrene has a density of 1050 kg m-3, so that’s a mass of 55 mg m-2. Over 3.16×1014 m2 of ocean that’s 1.7×1010 kg polymer. What would this do to the earth’s energy balance? Average insolation (accounting for cloud cover [Jin et al. 2002, cited by Seitz]) is 239 Wm-2. The monolayer cross sectional area fraction is pi/4. So the energy returned by direct overhead scattering is about 78 W. That’s huge compared to the current CO2 forcing of about 2.25 Wm-2. Modelling reported by Seitz indicates an increase of ocean albedo of 0.05 translates to an increase of planetary albedo by 0.031 [Seitz 2010; Figure 5]. So I’ll assume planetary albedo increase is 60% of the ocean albedo increase, which means we need ocean backscattering of 3.75 Wm-2. We would only need 4.8% of a monolayer to offset current CO2 forcing (ignoring the contribution from multiple scattering). 4.8% of a whole ocean monolayer is 8.3×108 kg of dry polymer, or about 1.7×109 kg wet latex. At say $1.20 per kg, this would cost $2.0 billion and account for 17% of 2005 global production capacity. This is, surprisingly, well within reach. $2.0b to reverse global warming is cheap. Restricting dispersal to the mid latitudes where the greatest effect is achieved, using core-shell latex technology, and properly accounting for multiple scattering would see this cost drop even further. Annual growth in latex production grew organically by 4.5% per annum between 2000-2005. Ramping production by 17% would be completely feasible. The ongoing cost depends on the residence time of the particles at the ocean surface. Equatorial currents run at about 1 ms-1, which would imply a traversal time of about 1 year for the Pacific ocean. Mid latitude the currents are much slower. The latex particles themselves will degrade in the environment, and there will be losses by association and entrainment in a complex marine environment. Figure 8. 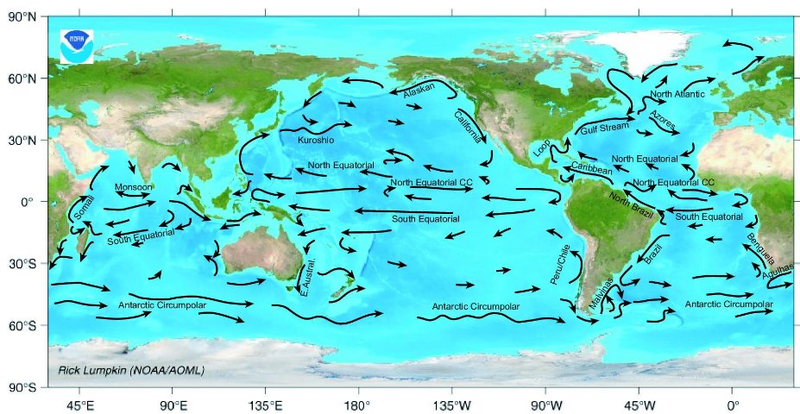 Major ocean surface currents. But let’s provisionally estimate a cost of $2b per year. This is significantly cheaper than, say, stratospheric sulfur aerosol injection which is estimated at $25-50b per year, let alone space sunshades. And it doesn’t require exotic engineering, enabling R&D, or orbital launches – it uses existing materials at a rate well inside existing production capacity. So consider this final elaboration of Russell Seitz’ bright idea: 0.1 μm diameter latex particles, possibly hollow, or of core-shell morphology, bearing a conventional stabilization system that is inactivated in salt water ensuring that the particles are retained at and near the surface, are produced in bulk using about 17% of existing production capacity and using commercial recipes, and are sprayed onto the sea from tanks aboard ships or crop dusting aircraft, oil rigs, and other structures, in the mid latitudes. For a cost in the order of a mere $2b per year we could offset current global warming, subject to the many disclaimers and qualifications discussed above, and many others not mentioned. More limited, local applications, such as the direct cooling of coral reefs as envisaged by Seitz for the microbubble concept, are also possible. As they say on Top Gear, what could possibly go wrong? I wonder how this will impact photosynthesis in marine plants. Seitz considers impact on photosynthesis for the micro bubble concept and concludes that photosynthetic activity, which is distributed in the top part of the ocean, would simply move upwards a bit. The situation is a bit different for the particle approach, where the scattering particles are presumed to reside at the surface, so raising the activity to shallower depths doesn’t help. But the albedo increase is not large – ocean albedo is ~5-10%, and I’m considering an increase of about an additional 1%, i.e. a drop in absorption from e.g. 95% to 94%. I suspect that would not have a large ecological impact, though I will defer to ecologists on that point. What could possibly go wrong? What about plankton — will they ingest this? Don’t we already have a massive pollution problem with the world’s oceans filling up with plastic which breaks down into microscopic particles that are then ingested at the base of the food chain, and gradually concentrate on their way up through the food chain? I’m thinking the sentence ‘we could paint the oceans white’ needs to go down in geoengineering folk-lore history, to be told around virtual camp fires when young Facebookers are online trying to scare each other with frightening tales of how mad all the adults in their world/s really are. If it came to it, I’d rather paint the sky white instead and leave our oceans alone. ;-) But I’m interested in what a marine biologist would say. I don’t like it. Have you never heard of the ‘plastic soup’? These particles won’t all float like a newtonian ideal fluid because they will coagulate with themselves or inorganic and organic substances that occur in the ocean. So they will go in suspension and will come into marine life. We must stop bringing harmful substances into the environment. Enhanced weathering. Processes that occur naturally and are inoculous. By bringing in olvine particles to the ocean surface, we also get some benefit in reduced solar absorptions. With a proven benign material. You can eat olivine and it is harlmless, though your dentist will disagree. This idea requires a new industry of the size of the cement industry. Seems doable. 10 euros per ton CO2 is not too bad, either. The degradation time of the latex particles needs to be considered. While we don’t want them dissolving in a day, nor do we want them hanging around for fifty years if they turn out to have been a horrible mistake. Anyone have a good estimate for the average lifetime of these particles? Macroscopic plastic pollution is very different to these submicron particles, even though they might be made of the same material. They can easily be made so as to be unable to coagulate, for instance by incorporating crosslinkers, which has them behave pretty much as hard spheres, and only associate with other particles through weak physical interactions, meaning they are readily redispersed by shear flow. The issue for any organism that might imbibe them is whether the physical obstruction of a 100 nm particle is problematic. Given that the ocean is a colloidal soup of innumerable particles in all size ranges including the range I looked at, while I defer to any physiologists I expect most organisms can cope, since they appear to do so already. Its a feature of their current environment, probably at higher levels that the 5 part per billion loading I considered. They can, like olivine, be safely eaten, if you really want. Capture by interaction with oceanic matter would presumably be the main clearing mechanism, presumably settling out on the ocean floor at milligrams per square metre. It might help to point out that the latex particle size I suggest about the size of a virus particle, and there is a lot of viral material in seawater. Larger organisms seem to manage with their physical presence, if not their infectious modes. There is a fundamental flaw in biological geoengineering agents. They unleash a new agent into the environment which they themselves may become an uncontrolled problem or problems, possibly more harmful than the original problem. Finrod, it depends on the polymer. Common polymers are durable, which is to say, we chose durable polymers to develop as commodity materials. Less durable materials could be used for trial if desired, but I don’t see the need. Remember, we’re talking about minuscule quantities of what is basically house paint or wood glue. We didn’t start tentatively painting houses or gluing wood for fear it might be a horrible mistake. Gene, this isn’t a biological geoengineering agent. EclipseNow, “paint the oceans white”. This was hyperbolic. A 1% albedo increase is probably invisible to the naked eye. Assuming the technique works, with no major marine biological impacts, the big drawback is that CO2 emissions will continue to increase. While we may have temporarily averted climatic tipping points, ocean acidification will continue unabated. That said, it might buy us a little time to get GHG emissions under control. Yes, this is no response to ocean acidification, and not a reason to avoid leaving fossil fuels behind us as fast as we can manage it. I am so going to play the smart guy next time geoengineering comes up… mind blowing post and great follow up in the comments. Thanks John. Earth, that wonderful blue and green planet, would become a green and white one viewed from space? Apart from the aesthetics, the concepts are provocative, and a reminder of just how dire our situation really is if we ever need to resort to such desperate ‘make overs’. But on the surface (pun intended), it sure beats the space umbrellas for being a feasible solution. I’d like to think we won’t need it, but actually fear we will. Thanks Ben. As I was working this through, I really did not expect the conclusion I arrived at, namely, that the strategy is so cheap, and fits inside current production capacity of commodity materials, apparently really can drive significant cooling, and we could start today. The end result really came as a surprise. Chris D, thats pretty much my position. And as I remarked to EclipseNow above, I doubt a 1% increase in scattering would be visible. Consider alternative proposals like stratospheric aerosol injection that are designed to produce a hazy sky or diffuse sunlight, that would have visible impact. proposal to get rid of CO2 by ionising it and letting the Earth’s magnetic field spit it out of the ionosphere? If humans are warming the planet (and they definitely are) they should start cooling it as well, or for the very least get the ability to do so if the need becomes very strong. At first impression, this particular idea looks excellent. I like the trivial cost and the big punch it packs. As the earth’s magnetic field declines and the ozone holes at N and S poles grow, is there some way to use bubbles in the upper atmosphere to shield us from UV? Or are chem trails the only answer? How many coal plants would we have to replace w/ Nuclear to get the equivalent reduction.?? Yet another SACTCAR approach. Swallow a cat to catch a rat. All planet-brightening approaches are such. The publication of Paul Crutzen’s paper http://www.springerlink.com/content/t1vn75m458373h63/ signalled to most it was time to bring discussion of geoengineering out of the shadows. He proposed injection of sulphur into the stratosphere, which is said to be so cheap there are many individuals on this planet who could pay for it. The Seitz approach differs only in its method, i.e. tinkering with the oceans as opposed to the upper atmosphere. Consider the first sentence of the 1988 Toronto Changing Atmosphere Conference Statement, http://www.cmos.ca/ChangingAtmosphere1988e.pdf which described human caused global warming as an “unintended, uncontrolled, globally pervasive experiment whose ultimate consequences could be second only to a global nuclear war”. Take out the words “unintended” and “uncontrolled”, and you have a good description of geoengineering. There isn’t a lot of difference between what humans have been doing especially since the beginning of the Industrial Revolution with fossil fuel use and a lot of what is discussed as geoengineering, other than what’s covered by those words “intent” and “control”. The planet can’t tell the difference. Geoengineering isn’t just some new thing we might add to the planetary system in order to buy some time for a civilization we presume might be about to awaken to its peril which would presumably then stabilize the composition of the atmosphere. “We” might have to employ radiation management techniques such as the Crutzen or Seitz proposal just to replace the “unintended” effects of aerosols that a richer Asia might reduce its production of as they fit pollution control to their coal plants while continuing to expand the overall fleet. Unintended, uncontrolled radiation management has been going on since fossil fuels were first used. Hansen points out in Earth’s Energy Imbalance http://www.columbia.edu/~jeh1/mailings/2011/20110826_EnergyImbalancePaper.pdf that he now believes that most modellers have underestimated the negative aerosol forcing. He asserts aerosols have been “counteracting half or more of GHG forcing”. We can expect Asia to dramatically reduce these emissions, and as they do so, the power of the GHG already in the atmosphere will be less restrained. Its planet management from now on. The main objection, as others have noted, to any radiation management technique is the fact that because elevated CO2 levels are left in the atmosphere, ocean acidification will proceed. What’s happening to the oceans hasn’t been realized until recently and the state of the art of describing what will happen is fairly primitive compared to climate change, but as I hear it, the only way to limit a great extinction event rivaling anything going back tens of millions of years is to stabilize the composition of the atmosphere as quickly as possible. We’re on the bridge of the Titanic after it hit the iceberg exchanging views at this point. Obviously, this doesn’t fix the ocean acidification problem, but we all know that. A further point, as I understand the work done in this area, the resulting climate from an SRM-based approach to geoengineering will not be the same as our natural climate. However, if the degradation rate of the microspheres is tunable, you might be able to get a better approximation than from (say) stratospheric aerosol injection if you carefully placed the release sites and controlled the release rate. GeorgeS, all of them, and it still wouldn’t be enough, because of the long residence time of CO2 in the atmosphere. If we shut down all the coal plants it would be a century and more hence before the effect was felt. We are already committed to 2.4 C warming. That is the consequence of our current CO2 level. If we want to hold to 2 degrees, we need to do more than just turn off the furnaces. The IPCC suggests the Greenland Ice Sheet can disappear completely if surface warming is maintained in excess of 1.9-4.6°C for millennia and raise sea level by 7 m or more. So we are in possible overshoot on some tipping points with catastrophic climate consequences regardless of what we do with energy. That gap requires carbon drawdown or geoengineering. Barry has written on the amount of warming still in the pipeline here and here. Somehow I suspect that micro-organisms will quickly adapt (i.e., evolve) to use the nanospheres for floaters or some such. May not be a deal breaker. David Benson, interaction of the latex beads with microorganisms and other elements in the very complex marine environment is one of the large uncertainties in the idea. The particles could be quickly removed to the depths, which would render the proposal unviable. However, it should not be difficult to determine the scale of these effects in small scale experiments. Fluorescent tracer particles in a confined pool, lake, reservoir, etc , would quickly reveal the kinetics of such processes. Thx for the input. Food for thought for sure. How about using saran microspheres with white tinted fresh water inside. They should float in salt water, last a reasonably long time and maintain their white reflectance for a lot longer than latex spheres which likely will stain with time. How do you make them? The appeal of using simple latex particles is that we already have well understood processes producing very large quantities in existing production plant. The underlying chemistry is very complex and our present understanding of emulsion polymerization has been hard won over a century. Doing something new is not easy or cheap, or necessarily scaleable. Doing something new is not easy or cheap, or necessarily scaleable. The proposals I’ve read for the sulphur gun seem very cheap and doable. And the beauty of the sulfur gun is that we’ve already seen the effects in nature every time a volcano blows, and if we discover terrible side effects, we can just stop. It clears itself up fairly quickly. The same can’t be said of painting the ocean white… there are just too many sea creatures to study. What effects would this have on the food chain? On various gills? On chemical or biological systems we simply haven’t discovered or properly understood yet? Nature ‘paints the sky’ regularly enough with sulfur. It’s survived far worse than we are planning on doing. But nature has never painted the ocean white. See Point 4 here for costings. Looks like we can fix the ocean acidification problem by adding olivine powder to the ocean surface. I’m wondering what the albedo effect would be of those olivine particles. Maybe we don’t have to put unnatural plastics in the environment and can simply add a mineral that occurs everywhere on earth. Plastics do degrade in an ocean and sun environment and can depolymerize or cross-polymerize. I also think public resistance to adding plastics will be big. If you chose something natural there’s a bigger chance of this being accepted (and solve the ocean acidification problem at the same time). EclipseNow, floating plastic rubbish is a completely different kind of material to submicron latex particles. It chokes animals. It tangles them up. It gets caught on them. It wraps around their beaks or snouts. Chunks of it fill their gullets. None of these modes are possibilities for submicron particles. Other than direct physical insult, the only effect on wildlife reported is apparently concentration of organic pollutants in the plastic. PCBs, polyaromatic hydrocarbons and so on are cited. It is claimed these agents enter the food chain when animals (jellyfish are mentioned) consume the plastics. I found this account unconvincing. These pollutants partition to plastic, but equally they partition to the lipid membranes of cells. If the pollutants were on the plastics, they were also in the microflora and fauna and already in the food chain. Because they partition to plastics, they probably also have low bioavailability in any animal that consumes them. None of the references given report health impacts in animals, only that pollutants were found on plastic. And, once again, this plastic is different to the kinds of materials I am talking about. A highly crosslinked latex particle has much reduced ability to absorb organic molecules that common plastics, especially something like PVC. Gills are structures that exchange dissolved gases across a membrane. Water flows past them, not through them. Small, hard latex particles only very weakly interact with other surfaces – they can’t stick, and water flow is enough to clear them. Besides, fish live in some pretty murky waters, and I’m only talking about parts per billion latex particles. There’s many orders of magnitude more stuff in the environment they have evolved to live in. The proposals I’ve read for the sulphur gun seem very cheap and doable. The sulfur gun is thought to cost $25-50b per year. That’s 10 – 20x more expensive than my first pass estimate on latex albedo enhancement. .. will be up to 25km long, subject to high tensile and bursting pressures [3000 atmospheres]. It will be a sealed unit, abrasion resistant, insulated to prevent freezing and made of a braided or filament wound fibre composite ..
and is light enough to be suspended by ballon. Pass me the unobtainium, I’ll get right on it. I haven’t thought about aircraft delivery, rocket shells, etc. They may be more plausible, but the sustained scaled of powered flight delivery to the upper atmosphere gives me pause. There is no technology gap to latex albedo modification. We are already making the materials we need at the scale we need at a cost we can quote and know we can afford. We have the delivery systems in place. The only thing we need to launch are the boats. Thats why its interesting. Pardon my scepticism, but I’d like to see what the peer-reviewed marine biologists say about the effects of both the plastic — which is bioaccumulating — and micro-rubber you’re suggesting. To which peer-reviewed studies are you referring? CyrilR, to have a useful residence time at the ocean surface, or to have a useful backscatter intensity, the olivine would have to be ground down to micron size. Thats a very energy intensive process and not one we already do at scale as far as I know. What would a megaton of micronized olivine cost? I also think public resistance to adding plastics will be big. If you chose something natural there’s a bigger chance of this being accepted ..
EclipseNow, I’d also like to see what the marine biologists have to say. I’m not suggesting proceeding without a clear and responsible view of potential impacts. What I’m saying is, provisionally, there do not appear to me be obvious risks, or at least the ones you are suggesting are not, to me, obvious risks. How many colloid science textbooks would you like to read? This is foundational stuff that crosses many disciplines. Try Isrealachvili’s Intermolecular and Surface Forces if you’re keen. I meant which studies into the consequences for sea life, not the viability of how the micro-rubber will behave in the water, or even crossing gill membranes. I’ll trust you on that. But the millions of different species of sea life will have millions of different gill configurations, water feeding mechanisms, suckers, and other water passage mechanisms I can’t even visualise. I’ll agree for now that options are good! Maybe I shouldn’t have sounded so negative off the bat. Keep pushing the envelope and thinking sciency thoughts over port, music, sunsets, fishing, whatever inspires you. With fossil fuel consumption rates still increasing, I have this horrible feeling we’re going to need every weird left-of-field idea we can get! OK, the white ocean was a red-herring (yes, pun intended), but the objections so far seem well answered, and until we get to the molecular level, that is, some serious biochemical objection to doing this on scale, then it looks more than feasible. Even if micro bubbles of latex interfere with the reproduction of some jellyfish or some obscure organism, will that in itself be sufficient reason not to utilise such a relatively cheap and effective palliative method between now and the effective abatement of carbon dioxide emissions? Compared to the destruction of the entire ecosystem, probably not, so we really have to get the possible risks isolated and deal with them on the large scale. If marine biologists can test this system and give us those risks, then we’ve got a way to evaluate it. Convincing a science skeptical public will be another issue entirely, let alone getting enough multinational political support to implement it. Grinding to 100 micron size costs 1 or 2 euros per ton. Less will probably not be needed because the olivine reacts with water and CO2 to sequester the latter as carbonate. Residence time is probably no more than 2 years for this particle size. But perhaps 100 micron is too big to float long enough and we need something more like 10 micron. that will cost more. Grinding rock, of various types, is done at very large scale today. posted 9 October 2011 at 8:52 PM by Cyril R.
Cyril, 100 micron is too big. 10 micron is too big. The backscattering is virtually non-existent, and the Stokes sedimentation velocity is too high to sustain a surface population. You need to be down in the 1 micron range. Grinding something to 100 micron is a very different proposition to grinding something to 1 micron. Can you point to an application where this is done on very large scales? Two areas that occur to me as possibilities are production of pigments and manufacture of specialty ceramics. I see Schulling says, “Grinding to 100 micron costs about 1.65 Euro/ton, but for finer sizes the cost increases exponentially.” Thats what I was getting at. 1 micron powders are a different kind of problem. Geoengineering is crazy. The sheer scale of the aspiration speaks of hubris. I agree. Your article is very interesting. I’ll think about it some more. 1. Where is rock with high olivine content, and suitable for quarrying or mining found? 2. What volume of olivine would be needed? 3. What volume of host rock would be needed? 4. Over what are would it have to be spread? 5. Would we have to spread repeatedly over the same areas? If so how often? 6. What is the cost per tonne to quarry the rock, crush it, separate the olivine from the other minerals that make up the rock, transport it and spread it? 7.	what would be the damage cost where the olivine is spread? 8. What would be the total cost per tonne CO2 sequestered? I’m seeking just a rough estimate so we can compare it with other options and with the various estimates of the costs of damages and adaption. Tropical areas with high temps and humidity and low wages are ideal. Think of it as a ‘clean development mechanism’. Some people suggest to use chemical reactors to make things happen faster. I don’t think this is feasible considering the scale – I’d prefer Schuiling’s method of letting natural processes take care of it while also getting additional benefits in fertilizer and acidity control for soils and the ocean. The acidity problem of the ocean is of particular interest since other geo-engineering proposals don’t reduce this. If I’ve understood it correctly, an aspect of using olvine milled to an optimal scale is that its multiple benefits would justify a multiple of the costs of a single benefit option – such as the very interesting micro-spheres proposal. – raising the transfer of CO2 from atmosphere to ocean and thence its carbon to seabed sequestration, i.e. contributing somewhat to planetary atmospheric carbon recovery. This is the first option I’ve seen discussed that would address all three essential objectives – and the fact that a natural material would be distributed would indicate a greater willingness of the public to provide the necessary funds. A further encouragement of support is the fact that by sinking, the olvine particles would offer a predictably short switch-off period as a reserve capacity in the event of untenable side-effects being observed. I should be very interested to learn more of the practicalities of this option. The cost to quarry the rock is close to US$9/tonne almost irrespective of labor rates. There is more than enough olivine to sequester the entire excess (44/12)x500 gigatonnes of CO2 in Papua New Guinea alone. For milling costs, study the literature on comminution; there is a formula giving $(size) for which Professor Schuiling’ds single estimate suffices to give the result for any size. Finally, the weathering of olivine by CO2 in water leaves no solid residues whatsoever. So the idea of using micron sized olivine particles as light scatters before the particles weather into nothing solid is quite intriguing; some of that may well be worthy of an experiment. My impressions from a peridotite quarry near home is that olivine weathering is too slow to justify human assistance. I also believe the fastest weathering (to magnesium carbonate) occurs with alternating wet and dry conditions near the surface, not constant immersion below the water table. I also wonder if the reaction is slower in saline water. My impression is that a kg of 90% olivine peridotite crushed to 1mm particle size would be lucky to absorb more than a couple of grams a year of CO2. Can’t comment on albedo effects but the CO2 angle is nuts. 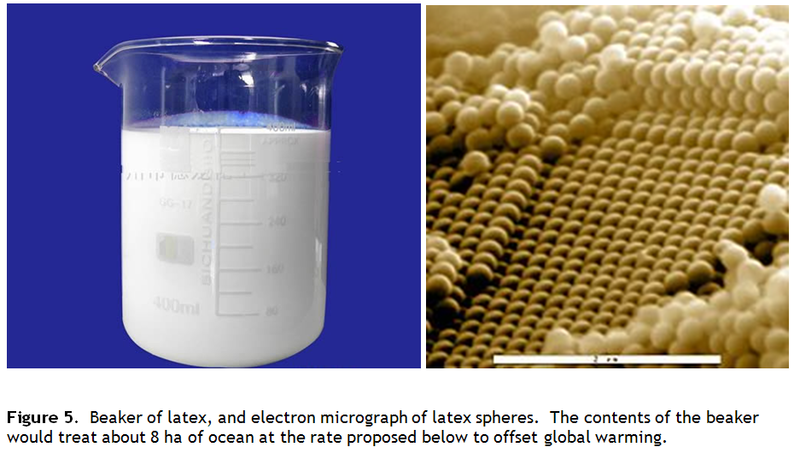 However, the questions for this thread revolve around the costs and benefits of replacing micron latex spheres by micron olivine spheres to enhance scattering of incoming solar radiation in the ocean. That the olivine spheres will eventually weather and remove some CO2 is a benefit which offsets the eventual loss of scattering when the olivine has weathered away. I just noticed David Lewis thoughtful comment above. For some reason it is out of order in the time stream; my one word response was in fact directed to GRL Cowan’s cryptic remark before it. SO what keeps olivine micron-sized particles from sinking too fast? in SI units. So a 1 micron radius olivine particle will sink at a rate of 1 m in 20 days. This steady settling is superimposed on turbulent mixing. The mixed layer depth is ~20-200 m. So the residence time could be approximated by loss from the bottom of the mixed layer, which would give an exponential decay in average near surface particle concentration with time constant approximately 400-4000 days. So at 1 micron the powder might well hang around long enough to be useful. At 10 micron, the residence time would be around 4-40 days, perhaps not long enough, as I guessed in my earlier comment (9.02 pm). That’s why you need spheres that float. Like hollow microspheres filled with fresh water tinted white. 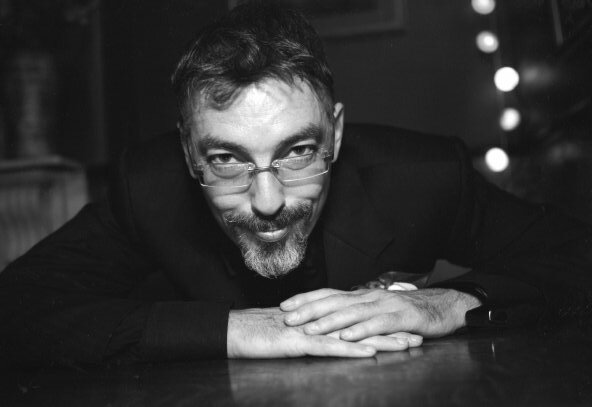 John Morgan, on 10 October 2011 at 7:41 AM — Thank you! We’re started. We need the commutation function which gives, rather precisely, the energy required to grind to various small sizes. We need the reaction rates for the two ways olivine weathers into ions in the carbonated seawater; these have some temperature dependency so there will be a slight advantage to using tropical water as opposed to the temperate oceans. Once reaction rates are given even I can work out under the simplest assumptions of spherical particles of olivine and constant concentration of CO2 derivatives in seawater how long the olivine particle lasts before completely weathered away. I gather from the little I understand about Mie scattering that the particle becomes a better scatterer as it becomes smaller, but I certainly don’t know the details. My thought is to grind down just enough that the olivine doesn’t soon sink below the mixed layer and then as it weathers it becomes more boyant (if I can properly use that term). In any case, this in principle becomes a readily solvable optimization problem in the two-dimensional objective function of CO2 removed by weathering and solar radiation scattered back into space. This rather stretched analogy is of switching, ASAP, from reliance on our ‘invincible’ dominance of nature – into reliance on the dynamics of the natural systems – whose abuse and callous disregard by society has brought us to this predicament. The Olivine powder option might be one expression of that change of priorities, in that it appears to minimize production and use impacts while offering multiple benefits in mitigating the results of past incompetence/corruption. (Much research needed of course into the full spread of possible consequences and yields under optimized techniques). Another such expression is the growing worldwide research of the production and use of biochar – another multi-yield mitigation option with exceptional carbon recovery potential – Hansen is on record as proposing that a global program could sequester enough to cut airborne CO2 by 8ppmv/yr. A recent study by WRI & WWF identified about 1.6GHa.s globally that could be viable for afforestation without impacting farmland adversely, offering a large feedstock resource in addition to current biomass ‘wastes’. Moreover, forestry optimized for biochar feedstock under the ancient sylviculture of “Coppicing”, accommodates exceptionally high levels of biodiversity. Crucially, beside plowing in biochar to sequester carbon and raise farm yields (by providing both a self-renewing fertility and a moisture regulating capacity), its efficient production requires local village-scale refineries and also yields around 28% of the feedstock’s energy potential as a crude syngas coproduct, with multiple potential applications that include methanol supply. In short, the biochar option seems exemplary not simply in its novel benefits offsetting costs, but also in integrating multiple human needs with current widespread ecological yields – rather than with the scarce geological hydrocarbon resources’ potential for exclusive control by wealthy elites and inevitable destabilization of the ecosphere. One point on the presentation of options for both albedo restoration and carbon recovery that seems worth noting is that they are in fact mitigation techniques. The widespread justification that they are about “buying time for an equitable and efficient treaty” seems both bad messaging – by inviting the charge that they are simply about postponing the control of emissions – and also less than candid. – Given a pipeline warming from today’s CO2e of at least 2.4C, along with at least five out of six major interactive feedbacks already accelerating off the timelagged warming of the mid-’70s, we face a rather limited time-window for commensurate action. Mitigating the airborne CO2 level by carbon recovery, and mitigating the feedback emissions by albedo restoration to a level to de-activate them are no longer options – they are sadly urgent necessities – just as much as is an advance from the nationalistic rivalries obstructing a climate treaty, to which they are the necessary and sufficient complements. Sorry for the over-long post. Its rare to find people who may be interested in such ideas. regarding the significant rate of carbon sequestration by olivine powder and of oxygen scarcity in seawater. David Benson (8.19am) raised the possible temperature advantages of tropical waters over temperate ones with regard to weathering rates. In response, two issues seems salient. First, to what extent if any might the vastly greater surface-to-volume ratio of micron olivine powder than of quarried olivine rock accelerate the rate of carbon uptake ? Second, given the greater surface turbulence and lower temperature of temperate waters, to what extent if any might a predictably higher surface-waters’ oxygen content also accelerate the carbon uptake ? The latter seems relevant given the desireability of cutting the Gulf Steam’s heat transport into the Arctic Ocean and, perhaps, its transport of olivine powder there to help offset the decline of summer ice cover. Full disclosure: two winters running the failure of the arctic’s Kara Sea to freeze up as normal has led to the deisel in my tractor here in Wales’ Cambrian Mountains going waxy and disabling it – due to prolonged periods below -26C, when extreme snow-cover meant the flocks were reliant on 200kgs hay bales’ delivery. Like farmers across northern Europe, I thus have a rather personal interest in arctic affairs. has the rate information in Figure 1. The crucial fact is that olivine weathering is about two orders of magnitude slower in seawater than on tropical (acid) soils (with plenty of rainfall). So as (I think) Schuiling proposed 100 micron olivine particles, the size which could fruitfully be used in seawater has to take the slower reaction rate into account. I beleive I now have enough data to give a coherent account of the grinding requirements. However, I’m no geochemist and if others would be so good as to make use of the cited paper (at least as backup) I would appreciate it. seems to have similar information and is in the opn. LC keep a backup vehicle in a garage in cold weather. Use jumper leads (same voltage) and repeat starting to drag the booger of wax through the injectors. That’s petro-diesel but with biodiesel made from saturated fats it takes even less cold to gel. Strangely diesel is the Achilles Heel of both biochar and crushed olivine. You need large amounts of the stuff to dig it up, get it to preferred size then move it from A to B. Also ANFO explosive in in the case of olivine rock. Then when you’ve moved either biochar or olivine to point B you have ask if it would have been almost as effective to leave it at point A while saving all that diesel. Lewis, interesting comments, thank you. To your first question, the instantaneous reaction rate for a given volume of material will scale with particle size as 1/r. So a gram of 1 micron powder would react 100x fast than a 100 micron powder. To your second question, turbulence won’t significantly change the reaction rate. O2 is not part of the reaction, so nor will dissolved oxygen content, but dissolved CO2 will and so will temperature. The reaction rate effects of CO2 content and temperature together are complex and I can’t guess how that will scale other than to broadly say increasing CO2 and temperature would both increase reaction rates. My large reservation about the olivine approach is the material and energy intensity. To within a stoichiometric factor, pulling down CO2 with olivine would seem to require a similar tonnage of rock as the coal and oil that we burned to create the CO2 in the first place. When I consider how long we have been digging up coal and at what a fantastic rate we have been mining and burning it, I just can’t imagine setting up a parallel industry on similar scale to mine, pulverize and distribute the material. Hence my interest in exploring low intensity geoengineering solutions. I hope your sheep made it through the winter. Thank you for the link: ftp://ftp.geog.uu.nl/pub/posters/2008/Let_the_earth_help_us_to_save_the_earth-Schuiling_June2008.pdf I had seen it before (posted on BNC some time ago). However, I do not believe their cost estimate of $10/tonne CO2 sequestered. Costs need to be properly estimated by those who understand cost analysis. In pre-industrial times the CO2 that escaped from the mantle was roughly balanced by the CO2 sequestered by chemical weathering. True. But the statement is misleading. There is very little olivine rich rock exposed at the Earth’s surface. In fact there is very little olivine rich rock in the crustal rocks. It is in the mantle. “CO2 sequestered by chemical weathering” was from weathering of other rocks, not olivine rich rocks. It can be carried out with standard mining and milling technology. That’s avoiding the question. The cost of mining depends on the depth and ore grade. The volume of olivine to sequester all carbon dioxide produced annually from fossil fuels is ~7 km3. Assume the average olivine proportion in the rock being mined is 1%. In that case we’d need ~700 km3, not ~7 km3. And we’d need to crush all the rock and separate it. And manage and store the waste. Once the mine is closed, the waste rock may have to be rehandled back into the abandoned pit or mine. Where are we going to find the quantities of olivine rich rocks close to the places where it is to be spread.? What is the area over which it has to be spread? If is spread at the rate of 100 t/km2, then we’d need to spread it over 230,000,000 km2 each year. Spreading would cost about $1 trillion per year (23 billion tonnes/a @ $50/tonne). In comparison, the volume of concrete poured every year is 6 km3. Most of the aggregate for concrete is extracted from alluvial materials. That is much easier than quarrying or mining. Some is crushed rock, but it is from readily available rock just about anywhere. And there is no need to crush the rock and separate out a single mineral (such as olivine). The largest open pit mines in the world have volumes around 20 km3. The vast majority of that volume is for waste removal, say 10 to 1. We could expect a similar ratio, on average, as we scale up to larger and deeper mines for olivine rich rocks. So the volume of rock to be mined becomes ~7,000 km3, not ~7 km3. When olivine mines become larger, and are located in lower-wage countries, and transport is reduced, the cost may drop to less than 10 Euro per ton of CO2 sequestered. That sounds like highly optimistic assumptions, especially since the spreading cost has not even been included. I wonder if the fossil fuels needed to spread the olivine have been counted in the cost per tonne avoided? The DOE link summarising their 2001 work is also interesting. http://www.netl.doe.gov/publications/proceedings/01/minecarb/oconnor.pdf . But only one slide (#8) mentions costs and that is for high grade deposits. The remainder is mostly about chemistry. With all those bubbles effectively increasing the area of the atmosphere/ocean interface, does conductive heating increase enough to significantly offset the radiative cooling effect of increased scattering? Or would this be offset in turn by other secondary effects, e.g. removal of heat as the bubbles eventually escape? I also wonder whether evaporation rates would be impacted. Sorry if this has been covered in comments already and I missed it. The real problem is we have not even categorised all the various kinds of micro-organisms in the ocean at the very base of the food chain, let alone tested them all for how they might interact with this stuff. At 75% of the planet, it’s a very, very big ecosystem to test. Why not just paint all our roofs white? Mark, the increase in projected area of the ocean surface is very small, and if the size of the bumps is smaller than the IR wavelength I don’t think they can add to the heat transfer anyway. Seitz suggests another application of the micro bubble idea is to reduce water loss by evaporation from reservoirs, so I suppose the answer to your second question is yes. Eclipse Now, multiple reasons. Spreading particles on the ocean surface gets the maximum scattering power from the latex, compared to layering it as a deep coating. Spreading on the ocean by spraying is vastly more time, energy, labour and cost effective than hand painting roofs. Whats the area of the ocean compared to the area of available roof? etc. Well, at least painting roofs in white or pastel colors gets you lower aircon energy use (for hot areas) and lower heating bills in cold dark areas (emissivity reduction lower radiative losses from the roof). Plus roofs are on buildings that have already disturbed ecosystems, so the added damage would be small. Also helps a lot to have more green in sunny cities, trees and grass fields help a lot to reduce urban heat islands. I wonder if we can put something in asphalt/tarmac to make it reflect heat but not visible light. Some kind of metal oxide additive. posted 11 October 2011 at 2:55 AM by Cyril R.
Thanks to John Morgan for a fair minded inquiry into an idea still very much in its infancy. i must however point out that global geoengineering is literally the last thing I expect to see done with microbubbles. I adduced this idea to provide an alternative to the intrinsic lack of local control that is the Achilles heel of schemes that rely on the stratosphere, which will disperse injected aerosols globally in a matter of weeks, without regard to local climate or season. But as peer review proceeded, it became increasingly clear, for msny of the reasons both Mason and my paper discuss, that water brightening on small scales at once poses fewer ecological risks, ( bubble optics should obviously be adjusted to minimize underwater dimming) and greater opportunities for development using existing technologies. Perhaps the most important practical difference between the empirical use of hydrosols in water conservation and reducing urban heating on the one hand , and global solar radiation management on the other, is that geoengineering does not exist in praxis, and is as deserving of suspicion as grandiose social engineering schemes. In contrast, almost every region and city presents solar radiation driven problems of heating and water loss. Bright water can obviously serve the same ends as urban roof and road brightening, hopefully on somewhat larger scales and at considerably lower costs, , but I believe fresh water conservation offers a far stronger case for technology development than salt water albedo modulation. The wolds loses a tonne of stored fresh water a day , per capita . This enormous evaporative drives famine and wildlife loss, and curbing it by even a millimeter a day could save lives– and species– throughout the world. As to monodisperse polymer microspheres, beyond costing a lot more than air, they have a charming propensity to crystalize into corruscatiing liquid opals . Having seen photo editors slap images of bubble bathes atop pop descriptions of my paper, I imagine john is in for some colorful ink! Fascinating post and discussion … but I haven’t read everything. If I were distributing buckets of money, I’d certainly put a bucket aside for some serious research into this one. On the other hand. There are a million advantages to actually fixing the causes of climate change … closing down fossil fuels and livestock, allowing massive deforestation. So I’d much rather fix the problem than work around it. But neither the fix nor the work around will be implemented in the current climate with substantial sections of the global body politic still not taking the matter seriously. When they finally decide on serious action, then the fix might be too slow so the workaround will have to be undertaken as an extra step. John Morgan, on 10 October 2011 at 1:15 PM — Thanks for the link, but unfortunately that PNAS paper doesn’t contain the required rate information. I’m pushing through the olivine-in-the-ocean idea just to see what the costs are, being unable to estimate the Mie scattering potentials. I agree that the scheme will require about one tonne of olivine for each tonne of CO2 removed, so it won’t be cheap..
Peter Lang — There are plenty of sources of ore grade olivine. NOt so far from here there is an olivine mine with a 200 gigaton reserve. You might care to check out Papua NewGuinea and New Caledonia: both have near surficial olivine deposits, the former being very large. Regarding the Hangx * Spiers paper, there is a pdf copy freely available from http://www.innovationconcepts.eu/ which I located using a web search on the title of the paper. I’ve naturally kept James Lovelock and Stuart Brand informed, but now I wonder what my old friend David Jones,makes of my paper? which back in the 1990’s floated the idea of cooling the earth by slathering the oceans with aircraft carrier firefighting foam, a medium nicely combining bubbles and polymers. My paper covers photocatalytic nanoparticles – catalyst coated bits of silicon, or TiO2, for example, that suspended in Brownian motion in surface waters would greet each dawn by blowing hydrogen and oxygen microbubbles, floating about reflectively as long as the sun shines, so perhaps Morgan and I should draft a neo-Daedalus column exploring other Dysonesque and dystophic variations on my theme. Daedalus might approbate a GM cross between mangroves and latex bearing halophile plants, euphorbiae, perhaps, with designer genes chosen to brighten the surrounding waters by bleeding white as crabs and chitons nibble at them on the rising tide. GM bubble blowing algae on the other hand strike me as a Very Bad Idea. I read them into the Not To Do list at the 2010 Asilomar conference because several of the ‘Snowball Earth” episodes in geological history lack explanations in terms of atmospheric chemistry or orbital forcings. Once upon a time in the Precambrian, a clever Prochlorococcus started to blow microbubbles, the better to get to the top of the Post-Strangelove Ocean. Arriving atop its evolutionary competitors, it soon became most of the mass of the marine biosphere, whereupon the ocean got awfully bright, and the planet awfully cold. Whereupon all the clever prochlorococci froze to death, along with everything else. End of Story. I obvious favor research aimed at getting the most out of ambient natural surfactants, by tuning bubble starting size to arrive at the most stable equilibrium the water quality allows, or using adjuvant inorganic “detergent builders’ in the small input stream of bubble-blowing water. However, if John can come up with a monomer solution, and I can think up a self-limiting gaseous polymerization catalyst to add to the air in bubble making machines, we should be able to create what look like ornaments for a nano-Christmas tree. Polymer walls in the five to fifty nanometer thickness range should allow us to tune the lifetime of shiny microbubbles ad libitem, allowing day by day brightening of rivers and reservoirs on a just-in-time Best Practice basis, with the bubble walls biodegrading into colloidal inanity before they get swept too far out to sea or up into the food chain. HOw big is small? That is, what sizes are we considering in this thread? On a telephone conversation with Matchless Metal Company a large supplier of abrasive compounds, they indicated the their chrome oxide was less than 1 micron. This is unverified information. From this and similar sources, one learns that small quantities of very fine materials are available, but the grit size quality control seems to be poor [as I had expected]. It appears it will be quite expen$ive to comminute olivine (or anything else) to the required sizes with decent quality control on the size range. Nonetheless, I’ll forge ahead on the olivine-in-the-sea concept in an attempt to come to grips with those co$ts. But neither the fix nor the work around will be implemented in the current climate with substantial sections of the global body politic still not taking the matter seriously. If you make a comment like that, it realy does need a response. Peter Lang — This is a technical thread. Kindly stay much more closely on-topic. From Figure 4 on page 5 of AQUEOUS MINERAL CARBONATION: Mineral Availability, Pretreatment, Reaction Parametrics, And Process Studies by W.K. O’Connor, D.C. Dahlin, G.E. Rush, S.J. Gerdemann, L.R. Penner, and D.N. Nilsen we see that cumminution of olivine to 11 microns costs ~120kWh/t [metric tonne] and to 2 microns ~340 kWh/t. These are indeed much costlier than the ~50 kWh/t to comminute from the mined ore sizes to ~100 microns. Schuiling estimates the later as equivalent to about US$1.80/t, i.e., US$0.036/kWh for industrial, so interruptable, energy. The submicron oxide particles in polishing compounds like ceria, chrome oxide or rouge are not produced by energy-intensive grinding or comminution. They result from the ignition of metal compounds, like carbonates or oxalates at temperatures too low for the oxide crystallites to grow larger by diffusion or Ostwald ripening. Russell, thanks for offering your comments here, and for your initial inspiring paper on the subject. I recall Daedalus and mourn its passing, this would have made for a good topic. I haven’t read beyond the literature cited in your paper, but once you start thinking in this area there are too many obvious next steps to imagine variants like the one I described have not been thought about. Your colleagues across campus in Whitesides’ lab for instance have the resources and experience in scattering and particle fabrication to run many of these ideas to ground. I’ve drawn a rather pessimistic conclusion about simple bubbles – are there other stabilization strategies I have missed that that would change my conclusion? Since the dissolution rate D is 100 times slower in seawater than in the tropics, Schuiling’s 100 micron olivine grit needs 100 times the surface area for the same mass, hence volume. Thus we’ll need 10 micron grit to acheive the same ‘complete dissolution’ in ~400 days, 1000 same particles for each of the larger ones. Fortunately the situation is a bit more complicated so it seems we may not have to jump all the way from ~50 kWh/t to ~140 kWh/t for the comminution required. We turn to this matter, using what I call spherical chicken physics as we make the simplest possible geometric assumptions. A(acid) = (1/400)(20-(1/50)) ~ 0.05. A = A(sea) = 0.01A(acid) ~ 0.0005. V(t) = v(r(t)) = k/(At+1/R)^2. so even using the Labrador Sea, with its ~2000 meter mixing depth, the 2 micron sphere will not be completely ‘gone’ at that depth. I conclude that the high costs of quarrying plus comminution produce little benefit in removing CO2 from seawater. The persistence of olivine sand beaches affords an interesting reality check on generalizations about how fast this ubiquitous mineral, and its more mafic cousin fayalite, interact with their environment. I’m still horrified that the half-life of biochar is, in some scenarios according to the peer-reviewed paper, only 80 years. Some of the Amazonian biochar has been there for *thousands* of years and only *improved* with time (as all the micro-organisms grow like crazy over it like sea-life over a coral reef, and add more nutrients — and carbon — to it). I’ll have to contact some experts at the IBI and try and find out what the deal is. Maybe that was a conservative estimate in soils that are worked extremely hard? The thing is, other than lowering the earth’s temperature, what else are these plastic balls good for? Nothing. The biochar at least feeds us, slows nitrous oxide emissions and nitrogen pollution in rivers, and adds life to dead soils while sucking Co2 out of the atmosphere and fixing it into the soil. (Far more by weight than the weight of the original biochar carbon as all the microfungi grow, die, and grow again). We often praise James Hansen for praising IFR’s… why not for his praise of biochar? Biochar can sequester carbon in the soil for hundreds to thousands of years, like coal. This technique is advocated by prominent scientists such as James Hansen, head of the NASA Goddard Institute for Space Studies, and James Lovelock, creator of the Gaia hypothesis, for mitigation of global warming by greenhouse gas remediation. How long will Biochar last? Well beyond your lifetime, and probably well beyond many of your future generations. Amazonian Black Earth or Terra Preta, which was man made and full of charcoal, lasted over 2000 years. But agreed, need peer-reviewed stuff. posted 11 October 2011 at 8:59 PM by Nick P.
Thanks for that nifty analysis David B. The conclusion comes as no surprise for other reasons, but its nice to see it worked through the way you did. Where are these olivine beaches? Peter Lang: many cubic miles of pure olivine are available right at the surface, often within a few miles of a point, e.g. the Twin Sisters mountains in, IIRC, Washington state USA, e.g. a large area of Oman. OK. I hadn’t been aware the orthosilicate part of Oman reached the sea. Here, figure 1, is the source I used to calculate, IIRC, that 100-micron pulverized forsterite (appearing on the chart as Mg) would weather to nothing in four years. 25-micron seems better for throwing into the troposphere so that wind will distribute it, and is eaten in the year after it lands. Olivine that includes a nonzero fayalite fraction will weather quicker, but as far as I know the fayalite portion pulls down no CO2. Less energy to pulverize it for a given lifetime, but more energy to disperse it. I would have expected olivine beaches to be orange, not black, because that is how olivine mountains colour themselves. In Lake Kivu I now think essentially all of the ultramafric rock grit will dissolve rather rapidly so the smallest grit sizes might not be necessary. The result would be a local (hence globally modest) decrease in CO2 expressed into the air. Ok, one micron latex spheres. While I’d still like for marine biologists to weigh in, the center of the North Pacific is a biological desert. Furthermore, all the plastic garbage finally makes its way there, pushed to the center by the clockwise currents around the borders of the North Pacific. If only that region has sloar dimming by scattered reflection, maybe the climate becomes a bit lopsided? I don’t think any of the proposed geoengineering techniques preserve the climate we have now. They all cause lesser or greater local changes even while staying within a given global average temperature. The disposition of ocean currents illustrated in my Figure 8 shows a strong partitioning to an equatorial band, particularly in the Pacific, which is where oceanic albedo enhancement would be most effective. A set of distribution points off the coast of Ecuador in the eastern Pacific, and the Phillipines in the west, could selectively brighten the equator for high effect with low material input. What do you mean “Russell Seitz at Harvard”? Cathy, in the “Bright Water” paper, Russell gives his institutional affiliation as the Department of Physics, Harvard University. Another material to use for protective microparticles is silica. Come to think of it, diatoms already do this for us as they build their silica micro-skeletons. Soluble silica in the oceans is often limiting for diatoms. So all we have to do is just add silicic acid to the oceans when it becomes limiting and all we are doing is augmenting natural processes to get our increased reflectance. Also diatoms are rather good at drawing down C to the depths. Thanks for the suggestion Oliver. The silica structures in diatoms do indeed appear to be on the right length scale for light light scattering. I don’t know how feasible seeding large swathes of ocean with silicic acid would be but its probably not harder than iron seeding for algal growth, or indeed latex particles. By the way, I noticed your website links to an antinuclear pledge. Might be a good idea to take that down if the plan is to reduce global carbon emissions. Thanks John. In my view nuclear power is a very dangerous, expensive distraction from the real solutions – which lie in renewables, supergrid, energy storage and responsive demand – not to forget efficiency improvements. In UK the government is getting close to making consumers pay nuclear power £165/MWh at the power station – far more even than offshore wind, before deployment experience has had a chance to bring the cost down. Oliver Tickell: You’ve got things back the front. Renewables, supergrids, energy storage, responsive demand and efficiency improvements are just expensive distractions which probably won’t even work from the real solution, which is nuclear power (it’s also safer than renewable energy). To get costs of even on-shore wind down to the level of nuclear you’ve got to make some pretty unrealistic assumptions. So if nuclear power is so cheap, how come EDF are demanding a price of £165/MWh at the power station guaranteed for 30 years? On top of all the other subsidies like fixed price (underwritten by taxpayers) decommissioning and waste management, and public liability insurance exemption? That price you quoted would be downright reasonable compared to the cost of renewables with all your Rube Goldburg like smartgrids and energy storage systems (they will not be cheap). Never mind that the UK can’t even live on its own renewables, see Sustainable Energy — without the hot air for details. For the UK at least it’s nuclear, fossil fuels or being a hostage to other countries, even if they maxed out their renewables. Oh and discussion around here is mostly in the forum these days. Areva prices are not the best bargain on the globe. The UK has been offered much more economical Russian reactors. Even Areva is talking to the Chinese for financing and lower cost constructions. Our mental baggage is the cause of high nuclear prices. The latest Indian PHWR cost $1700/kW in India. The cost of the EPR in France has been estimated @$6800/kW, 4 times higher. Please switch over to the BNC Discussion Forum to continue this conversation. Click the “Forum” tab on the top of the page for easy navigation to the site.You will need to start a topic thread, of the same name as this old post, on the “BNC Blog Post Comments” board. Further comments here will be deleted. Thankyou. Nuclear Ammonia – a sustainable nuclear renaissance’s ‘Killer App’?